Heel lifts and shoe lifts are prescribed for a number of reasons. The health problems may include lower back pain, correcting a runner’s gait, Achilles tendon pain or physical rehabilitation. The heel lift and shoe lift are the same thing. They’re used in one or both shoes. 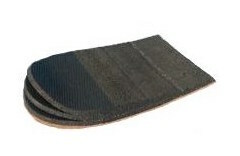 A heel lift is different than a heel cushion. A shoe lift or heel lift is used to treat biomechanical problems with the foot or gait. A majority of people have a measurable leg length difference of 1/4" or more, although most people adapt to the difference with no apparent ill effects. Unfortunately, some do not, and the effects range from low back to hip, knee, or foot problems. Compensation for problems elsewhere in the body, such as pelvic or spinal scoliosis. These biomechanical compensations for even a slightly short leg can have long-term side-effects. These problems are often related to the adaptations that occur due to continuing unbalanced movement, and can be aggravated by the extra stresses of sports activities such as running. Short leg syndrome or anatomical (structural) or functional (adaptive) leg length discrepancy, is often treated using heel lifts or shoe lifts. Heel lifts, also known as shoe lifts, are firm wedge-shaped inserts for shoes, which attempt to better balance the lower body by adding to the length of the short leg at the point when the heel strikes the ground while walking. When coming to Family Foot and Ankle Specialist, we will examine your walking pattern and measure you for limb length discrepancy.